rank 198: commentcamarche.net – 13,000,000 v.u and 210,000,000 p.v. rank 295: gamespot.com	– 10,000,000 v.u. and	150,000,000 p.v. rank 385: ibm.com – 8,900,000 v.u and 250,000,000 p.v. rank 434: engadget.com – 8,100,000 v.u and	110,000,000	p.v. rank 445: chip.de – 8,100,000 v.u. and 140,000,000 p.v. rank 824: stackoverflow.com – 4,700,000 v.u and 41,000,000 p.v. rank 850: techcrunch.com – 4,700,000 v.u. and 34,000,000	p.v. rank 892: wired.com – 4,600,000 v.u. and 34,000,000 p.v. GTX 460 Countdown on Some NVIDIA Sites? 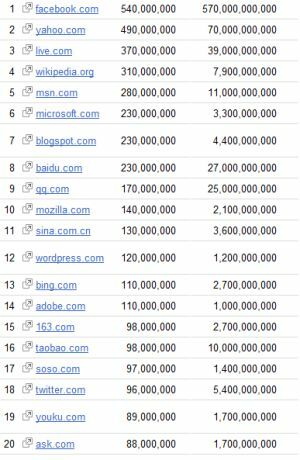 http://www.google.com and http://www.youtube.com, amongst others, are probably not on the list because it’s Google who made this list.